Temperatures increase late Friday morning as a warm front pushes through. This warm front will trigger scattered rain across southern New England, while northern New England will get snow and a wintry mix. Friday afternoon will be mild and breezy with spotty rain chances. It won't be a complete washout. There will be plenty of breaks in the shower activity to enjoy the milder air. High temperatures will be around 50 south, around 40 north. Northern New England will see light snow Friday into Saturday morning with about 1-to-3-inches of accumulation in the mountains. Slightly cooler for the weekend after the cold front moves through Friday evening. Saturday will be in the low 40s, partly sunny. Sunday more sunshine and highs in the mid 30s. Ski resorts will have fantastic conditions during the long holiday weekend. Breezy Saturday, light breeze Sunday and less cloud cover, highs both days around 20 degrees up north. Sunday night into Monday morning a weak disturbance passes to our south. A few light snow showers are possible Monday morning across southern New England. Forecast models are trending more south with each run. A second disturbance tracks across New England Wednesday into Thursday. This one looks to bring snow north, mix to rain south. 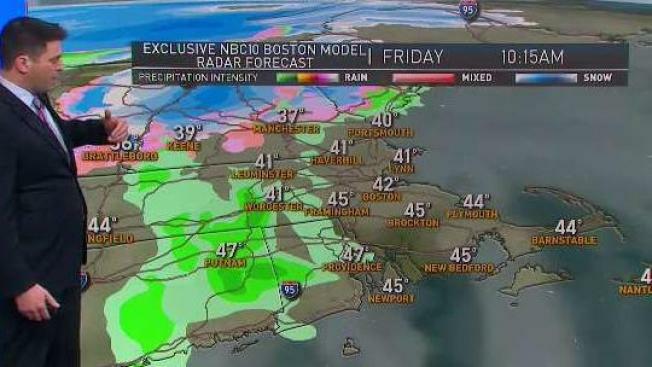 Unsettled weather lingers into Friday with light flurries. Then a fourth chance for precipitation moves in for the following weekend, bringing in the same kind of storm with snow north, mix south. High temps remain in the low 30s all next week into the weekend.